Oh how we’ve become so dependent on our phones. It has contacts, important messages to get to and social media. Alas I’m without a my phone for a few days because sweet Hattie Mae likes to throw most things she can get her hands on. Yep, as many times as I’ve dropped my phone this was the drop that sent my screen into blankville. I get nada, just a black screen. With that said, I will have Andy’s phone so please call 206-251-6773 if you need to reach me by phone. Or PLEASE email me at bamboo.brokerfamily@gmail.com if you have placed an order but haven’t heard back from me. This transition has its bumps, some emails are not coming through while other are perfect; not sure what that’s about. What’s the Word with Bamboo? The summer is upon us (almost here on Vashon Island) and you might be wondering what’s the deal with our little business. Some of you have ordered and received lickity split, while other are still waiting to be processed. Mainly those international orders!! I AM SORRY TO KEEP YOU WAITING! Life has given me much to juggle and I am not able to operate the business full time as my late husband had done so beautifully. With that said, please know I am filling orders as fast as I can. Before Andy passed away, I had my own massage/healing practice that is back up and running. I wear many hats at this point and if you don’t hear from me right away, please know I am not ignoring you. I am most likely working and not home until the evening, too late to return most calls. I know that I will find the rhythm to make life and business run smoothly but in the mean time it has had its bumps. International Shipping: I will be focused here for the next few weeks. This means you Canada!! Which might push back delivery for the domestic orders a week or two; FYI. My deepest apologies for not being able to put the time needed into these orders. Your patience is appreciated. We still have half the stock left of Standard 12′ bundles and I am waiting conformation for the next trip to China come 2017. Andy is missed daily, as I’m sure you can imagine, yet our life continues to unfold. Miss Hattie Mae will be turning ONE on June 22. Hard to believe she was only 3months old when Andy passed away. She is doing great and keeping us all smiling. First thing first, the number on Bamboobroker.com isn’t connecting as usual and my web designer is gone for the month. Please call 206 422 2563 with any bamboo related questions. It has been two months since my life took a turn into this very supportive community of Rod Builders. Thank you for your patience as I step into this new chapter of becoming The Bamboo Broker Family. It hasn’t been easy to step into the shoes of such a great man, but here we are. Hattie and I are finding a rhythm that works for the both of us as she watches me fill your orders. Life with a 5month old and a teenager has it’s own agenda at times (ok most of the time). Yet, slow and steady I am understanding what it takes to run this business. With that said, please know that I am doing my best to maintain communication. If I don’t answer your call please please leave me a message; I will get back to you. With Hattie Mae by my side I am not as free as Andy was to take every call as they come in. But I promise to find the time to connect and return your call. Working away to fill new orders as well as the back orders, I have moved quite a bit of cane. We are officially OUT OF STOCK OF XL. We have plenty of our Standard Grade A bundles. Please note that shipping cost have increased with YRC as of NOV. 1st due to a charge for 12′ length bundle by 75$. I am working to find the best rates, please know that all rates I give are subject to change. 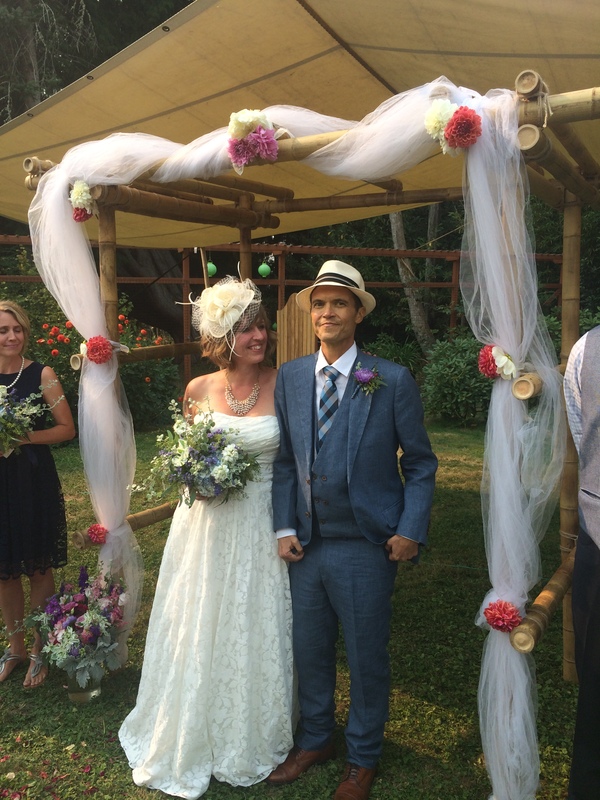 Just a short post because Hattie is telling me my time is done by her maddening cries, best to all of you who have supported and continue to support The Bamboo Broker/Andy Royer and now our Family! Also, I recently unearthed a single (ONE!) bundle of Standard 12′ x 2″ poles. This is a bundle I had unwrapped to inspect for mold upon arrival of our last shipment. There is some dried mold but nothing worse than anything else that has shipped out in the last year. The packaging won’t be pretty but the bamboo is in fine shape. This single bundle is priced at regular pricing, $240. Please call or email if you are interested in any of the cane we have in stock. That’s it for now. I’ll post something when we get our ship on the water. Ms. Hattie Mae Royer (A true miracle baby; I had been pronounced “sterile” many months before she came into being.) 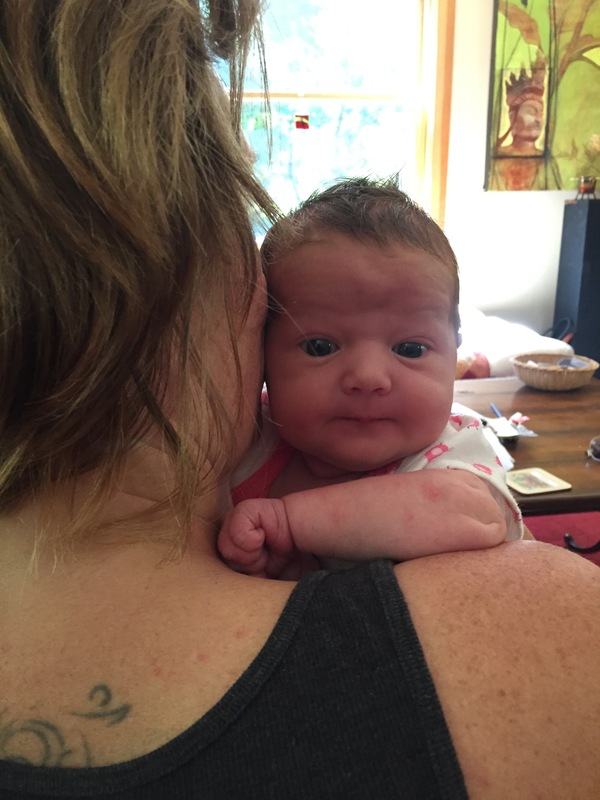 Born June 22 8.5lbs 22″ Momma and baby both happy and healthy. Sorry for the lengthy delay between posts here. There is a lot of movement around here lately but unfortunately, none of it involves bamboo. I am still undergoing chemotherapy treatments every other week and now, as I write this in the late evening of Father’s Day 2015, we are expecting a baby any minute. I wanted to get this out now because so many of you have written lately seeking information and I have not been getting back to people. We were done selecting this year’s bamboo by the end of February, four months ago. Since then, we’ve had to wait a terribly long time to get everything ready to ship in large part because the rural farming area in which we work is becoming more and more devoid of available labor. We only had two women (instead of the usual number of five) helping me do my selection work this year and those two same women were left to cut, clean and package every pole we selected. That took many weeks longer than normal. 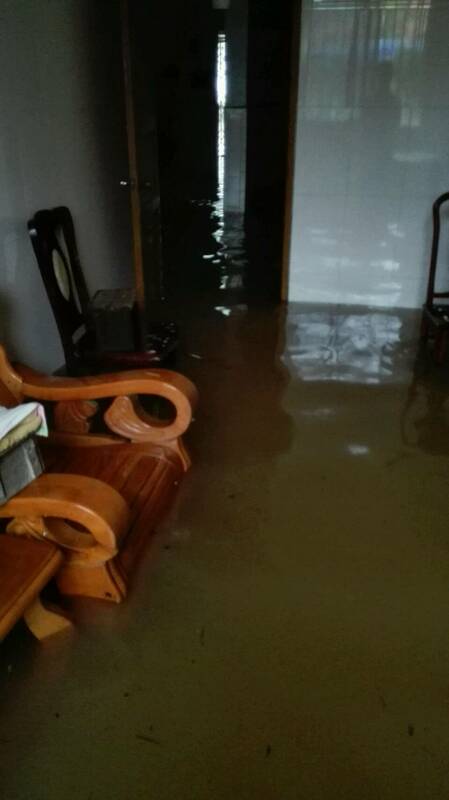 Then, as we were getting ready to ship in May, the town of Aozai suffered it’s worst flooding in at least 40-years. This area is used to the river rising every May/June and topping flood-levels every five years or so. But this year’s rise was unprecedented. This is the road in front of the house where we stay. The road is 15-20′ above the river level and here, lies about 1/2 mile from the river itself. Here is the living room inside the house. 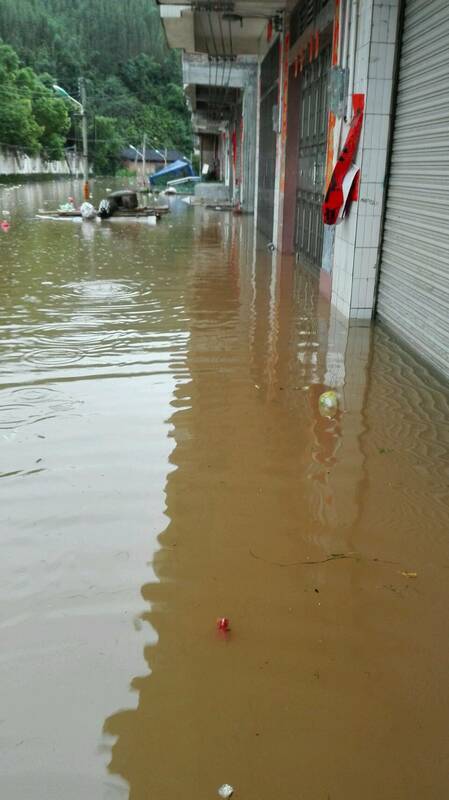 Thus, we not only had additional delays for the people of Aozai to take care of their immediate needs, we also lost a lot of bamboo poles that simply were flooded out of the warehouse. Most of the bamboo lost was not the poles we had selected for rod-builders. However, we did seem to lose a good portion of….. our XL poles. This is especially hard for everyone here because we had a shortage of these poles last year. Thus, many of you had contacted me many months ago about getting on a wait list specifically for these larger poles. We now have a very limited number of them due to ship to Seattle. In short, if you have been on the wait list for XL poles, I will do all that I can to ensure that you receive at least part of your order. I’m very sorry to say that any new inquires for XL poles will have to be put onto a wait list for 2016. The waters have receded in Aozai and they say that the poles that remain look fine (and it was a nice looking batch this year). Whether mold from the moist conditions will be an issue I cannot say. I asked our supplier to open the bundles and have a look and he reported that they were fine but we had an issue last year and I am guessing that we may again this time around. The good news here is that, as far as I know, other than requiring a bit of elbow grease to clean some of the poles, the mold was NOT a major problem for anyone (please correct me if I’m wrong). We are ready to finally get the show on the road here within a couple of weeks. I’ll now estimate that the container should land in Seattle by the first of August. Please understand that I am receiving your emails and phone calls but because of a few bumps in the road, I’m still slow in my responding. I WILL get back to you and I will get more precise information up here as quick as I can. I am terribly sorry for the delays and for the shortage of XL poles. We will continue to persevere and aim to make this a great year for cane. I do (once again) very much appreciate everyone’s patience and understanding through all this oddness. And I am again grateful for all the thoughts and prayers for my family and I as we bring many of you along on our journey. The bamboo shipment to Seattle should be here in June. We’ll be able to send out shipments immediately upon arrival to those of you waiting for Standard and XL bundles. We currently have Blondes and 6′ bundles available from the warehouse. EUROPE – We are about to get a shipment underway to the UK. We need to hear from you right away if you would like any bamboo on this shipment as we expect that we may not be able to warehouse the material long-term. Please let me know very soon (before the end of April) if you would like any poles shipped to the UK in May. We are transitioning from one bookkeeper to another here as Mary is being replaced by Candise (my soon-to-be-wife). Candise may start handling some emails and phone calls but probably not before this summer. That’s it from sunny/rainy/sunny/rainy Vashon Island. I do hope that spring has sprung for all of you out there and we will look forward to being in touch soon!